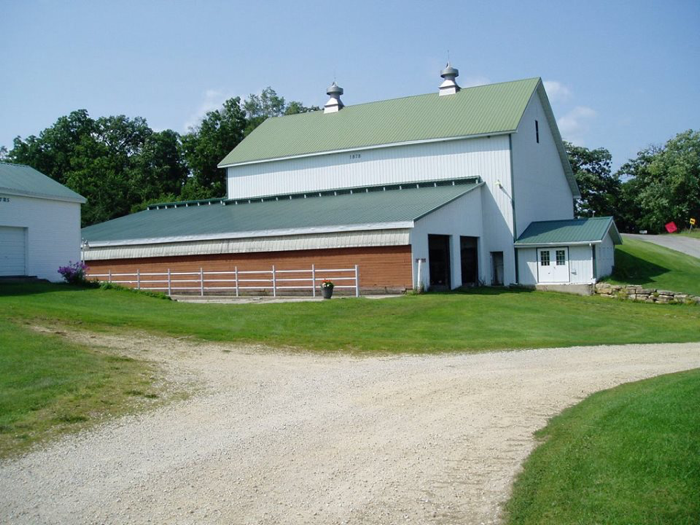 Barns are a defining feature of the Wisconsin landscape, and hold a special place in the history of Wisconsin. 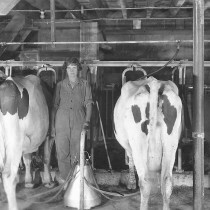 Among the many barns that contributed to Wisconsin’s place as a major dairy producing state is a Swiss barn that was built in 1878 in Green County. This barn, the Hefty-Blum White Barn, was used to raise cows for over one hundred years. In 2001, the dairy operation in this barn was shut down for good. 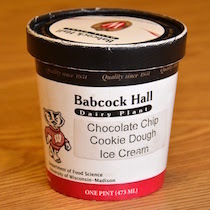 This Swiss-style dairy barn has undergone a number of changes since it was first constructed, but the expansions of the barn demonstrates the value of dairy production in Wisconsin, and helps explain how the dairy industry came to dominate Wisconsin’s economy. The Hefty-Blum White Barn was first built in 1878 by Thomas Hefty, a Swiss immigrant who traveled with his family to the United States. Thomas’, Fridolin Hefty, helped to establish the village of New Glarus, and later bought land a few miles outside of town to raise his family. It was here that Thomas was raised, and eventually the farm fell to his care. Originally the main product of the farm was wheat, but a mild winter in 1877 combined with an extremely dry summer in 1878 caused the majority of the crops in the region to fail. It was at this time that Thomas Hefty decided to build a large dairy barn to create a new source of income for his family. Most of the milk from Thomas’ farm was used for making cheese, and this lead him to later build a cheese factory on the farm as well. 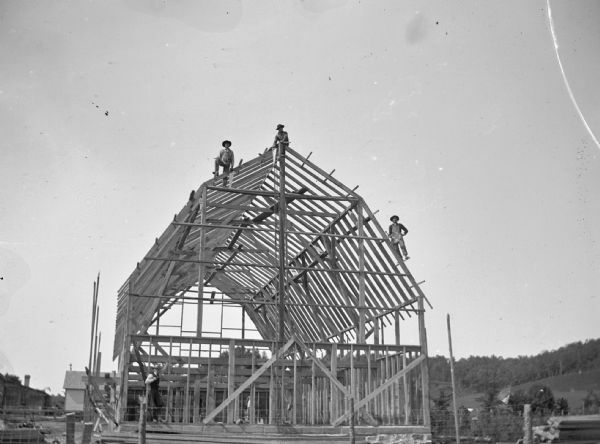 Raising the frame of a wooden barn like the Hefty-Blum White Barn took a whole community, like in this barn raising in Kenosha from 1891. Image courtesy of the Wisconsin Historical Society, image ID 37272. The original barn was a two-story structure that measured 72 by 36 feet in size. This barn could hold approximately 50-60 dairy cows at any one time. The walls of the lower part of the barn were built out of quarried stone from a nearby site. The timbers of the first story were hand-hewn from trees found on the farm, where the logs of trees were simply stripped of their bark and then shaped using axes. The upper section of the barn was built using boards and beams shipped by train from the lumber mills in the Northwoods. Although it is painted white now, the barn was originally painted red because the iron oxide that was plentiful in the area made red the cheapest color paint to make. It was necessary to paint barns because the paint preserved and maintained the wood siding of the barn. 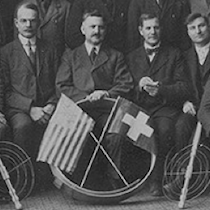 New Glarus was settled by Swiss emigrants, and Thomas’ built his barn in the style of barns in Switzerland. There are several key features that define this particular style. First, the barn is considered a bank barn because it was built into a hillside, with one wall of the first story built directly into the hillside. Thomas used quarried stone for the foundation and to hold back dirt from the hill itself. The reason for building the barn into the side of a hill was that then a ramp could then be built out of earth and wood planks that would lead from the top of the hill into the second story of the barn. Thus, a wagon or tractor could be driven right into the second story which was used as a dry storage area for hay for the animals. Another feature of typical Swiss barns was the cantilevered forebay, which was essentially an extension of the second floor of the barn that jutted out a couple feet from the first floor. This overhang provided shade and cover for the animals and farmers on sunny and rainy days. 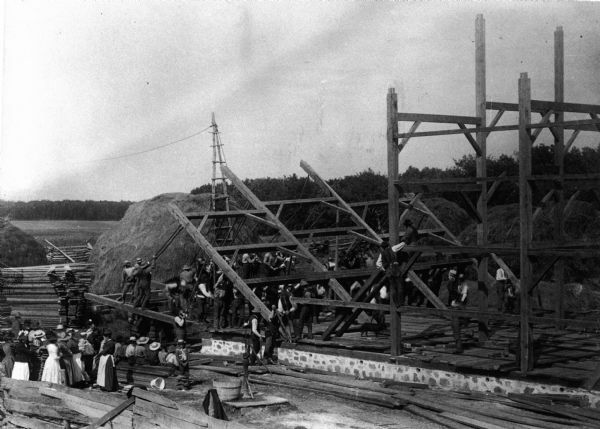 Once the frame was in place, farmers often used local materials to build the sides and interiors of the buildings. Image courtesy of the Wisconsin Historical Society, image ID 53801. 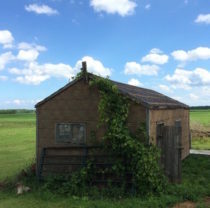 Barns like the Hefty-Blum White Barn can still be spotted among the rolling hills of southwest Wisconsin, in the regions settled by Swiss emigrants. Barns illustrate the transition towards dairying that swept the region after the failure of the wheat crop in 1877, a trend that helped to develop Wisconsin’s reputation as the dairy state. Object history written by Christopher Seitz. 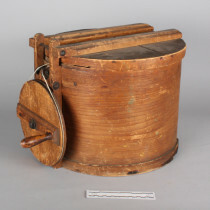 Object history created September 2018. Apps, Barns of Wisconsin. Pg. 32. Jerry Apps, “Wisconsin’s Changing Farmsteads,” Giving Old Barns New Life, (State Historical Society of Wisconsin, no. 2), 8. Nancy Schumm-Burgess, “Cantilevered Forebay Barns.” Video presentation. Feb. 16, 2018. Schumm-Burgess, “Cantilevered Forebay Barns.”, Jerry Apps, Barns of Wisconsin. (Madison, WI. : American Printing Company, Inc., 1995), 86. Fred G. 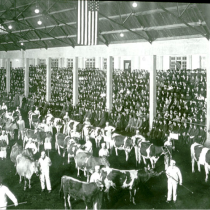 Blum., The Known Evolving History of our White Swiss-American Barn. (From the unpublished memoirs of Fred G. Blum, April 2010.) 5.